We do everything within our means to treat each homeowner and their homes with the utmost respect. We build as if we are going to be living there and want it done correctly. With that being said, our building is sometimes slow and methodical, but not lacking in the end result. Therefore, our schedule fills up quickly for both estimate appointments and actual building. We are currently contracted out into July of this year, and are now scheduling estimate appointments for projects to be on our Fall schedule. If you like what you see of our work, if what you like what you hear about us, and if you're serious about investing in your home - whether it be a small or large project, then give us a call to get your outdoor area in the planning stages for Fall 2017. Unfortunately, we have been at the mercy of the Underdeck installation crew and the electrician's schedule on this project. Sometimes that happens....when you're good, when homeowner's trust you, you stay busy. So, with that being said both of these contractors did great jobs, as you see in these completed project photos. ​- We Installed the Eze Breeze window systems, that are customized to our or your specifications, with a 34" door with 4-track windows built into the door. - Underdeck Oasis deck drainage system installed by Underdeck Oasis in the Clay aluminum color. To refresh your memory, this is the Timbertech Tigerwood Deck we installed before we completed the Eze Breeze room, or had the underdeck drainage system installed. - American Aluminum Railing in the black color. - Most existing framing members remained, and we installed new framing members where it was needed to support the composite deck load. For the most part this deck was still in good shape. So, all we did was change out some framing members to beef up the framing in order to support the roof load. Changed out some railing as well. If you would like some shade for the summer months, give us a call for an estimate. Finished this pond dock this morning, and all the rain headed this way next week should fill up this pond. Customer will supply and attach his own large, nautical manilla rope railing. This was a fun and muddy project! Keep checking back for upcoming decks, and 2 more docks. - 2x10 joists @ 16" o.c. Hope to have this small pond dock finished up today. Keep checking back for the completed photos. We've got 2 more docks scheduled for this month if the weather and lake water permits. 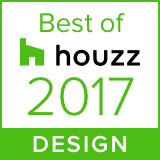 Cincinnati, OH, January 18 2017 – Thomas Decks, LLC has won “Best Of Design" on Houzz®, the leading platform for home remodeling and design. Thomas Decks, LLC was chosen by the more than 40 million monthly unique users that comprise the Houzz community from among more than one million active home building, remodeling and design industry professionals.